Iceland’s hot! Errr…I mean the new “world’s most popular” destination. Easy to get to/navigate around, safe, folks speak English. Plus crazy scenery you don’t normally see at home. Been in any glowing Ice Caves lately? Right I figured that. Safe also to assume you haven’t run into any glowing icebergs sitting at your local beach? Yep, you want em, Iceland’s got them! For those of you who love a map: Cave shot taken on the Vatnajokull Glacier, the beach is outside the Jokulsarlon Iceberg Lagoon. How bout a giant wall of water crashing down on your best buddy! 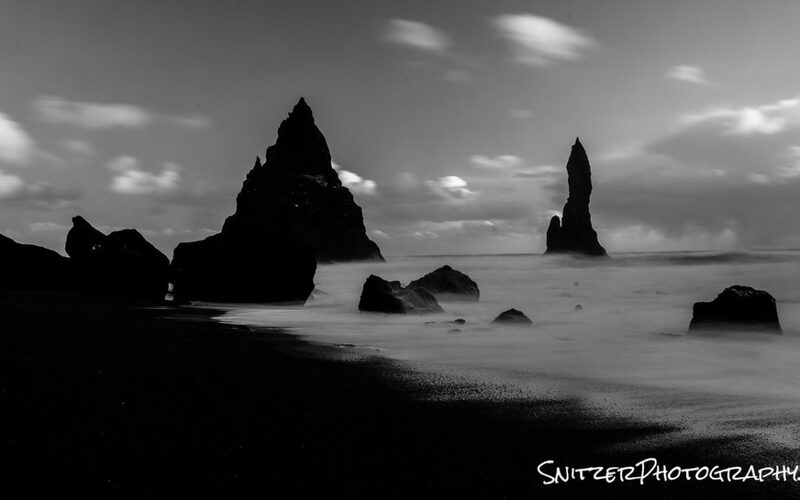 If you’ve seen one beach filled with black sand, you’ve seen them all. Actually, I’ve never seen one! This place (beach outside the town of Vik) is nuts. Lookout…here comes some rough weather!!! Once the storm passes…it’s time for a rainbow! Woooooo! When’s the last time you saw the Northern lights in the U.S.? Err….unless you count Alaska. You can also check out Iceland’s largest City, Reykjavik. Not the world’s most exciting place, but home to the greatest duck ever. We met at Hljomskalagadur Park. He’s now living in our guest room. Bottom line: For out of this world scenery, this place is a must see. Winter is the best time for serious photographers. For muggles, suggest you avoid the summer rush and visit in Sept or October. When I refer to “summer rush” keep in mind that this small island of 340,000 people had over 2 million visitors last year. Try to avoid the “high” season.